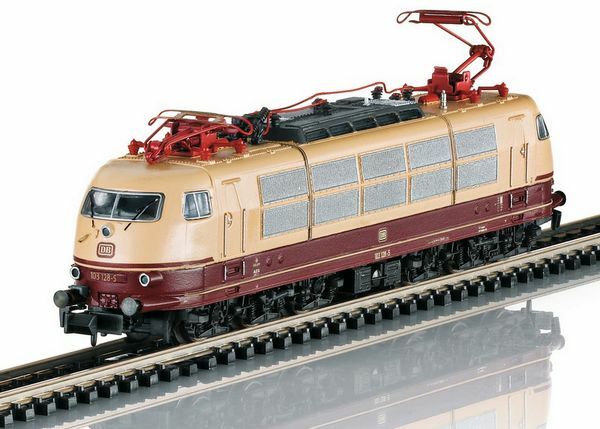 Prototype: German Federal Railroad (DB) electric locomotive, road number 103 128-5. C-C wheel arrangement. Built starting in 1970. Use: TEE, EC and Intercity trains. Model: The body is made of plastic filled with metal for improved pulling power. The locomotive has a built-in digital decoder and sound generator for operation with DCC and Selectrix. It also has a motor with a flywheel. 4 axles powered. Traction tires. The headlights and marker lights change over with the direction of travel. Warm white LEDs are used for the lighting. The headlights, marker lights, cab lighting, and engine room lighting can be controlled digitally. The locomotive has a close coupler mechanism. It also has separately applied grab irons. The headlights and marker lights change over with the direction of travel in analog operation. Length over the buffers 122 mm / 4-13/16". 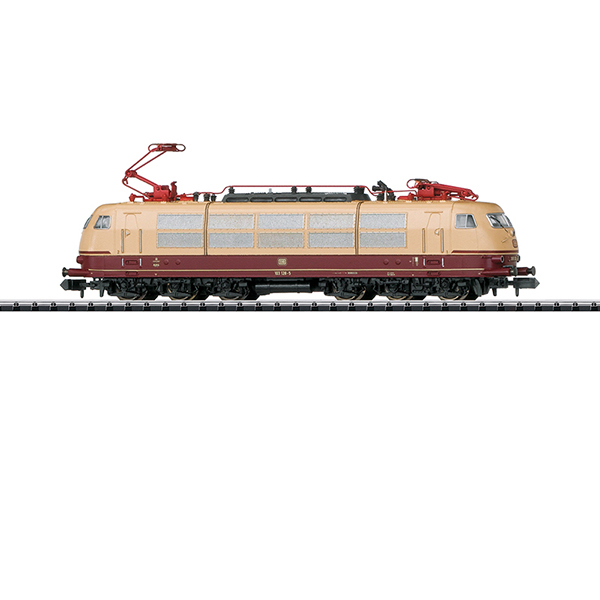 Cars to go with this locomotive can be found under item numbers 15459, 15460, and 15461. At the end of the Seventies, it became evident in the interim that the 3,115 kilometer / 1,947 mile first class only IC network at that time could also cover a large part of 2nd class long distance passenger service with its stops. The DB therefore decided to introduce hourly schedules with mixed class trains on the four IC lines at that time at the start of the summer schedule for 1979 on May 27. This followed the slogan "Every hour – every class": the "IC 79". All of the hubs remained intact for this. The new magic phrase was block trains and all IC trains thus ran with blocks of cars for 1st and 2nd class, separated by a dining car or Quick Pick cafeteria car. It was pure chance that the routings of the lines being run were set up in such a way that at hub stations the same car classes stood opposite each other. Still, there were line swaps as demonstrated in particular by the ever poorly utilized Line 4 north of Hannover. In addition, the IC trains ran in some cases beyond the basic network and on the so-called "approach and exit routes" the cities of Aachen, Amsterdam, Berchtesgaden, Braunschweig, Bremerhaven, Brussels, Garmisch-Partenkirchen, Geneva, Innsbruck, Kassel, Klagenfurt, Kiel, Ludwigshafen, Milan, Regensburg, Saarbrücken, Westerland, and Vienna were served by the IC trains. One hundred fifty two trains now ran on the four lines of the main network. As a rule, these trains consisted of three 1st class cars, a dining car, and seven 2nd class cars. In case of need, these consists with a train weight of 500 metric tons could be lengthened by one more car. The existing 144 class 103.1 locomotives also were the motive power for the majority of the IC trains. On some trains however, units of the classes 110, 111, and 112 had to help. The best thing about the new system was the introduction of the timed system exact down to minutes. A passenger could now absolutely rely on the IC trains leaving every hour at the same minute. The DB had thereby created a new foundation for long distance service with the interconnected and timed IC system. This new offering for everyone doubtlessly fostered recognition of considerable progress compared to the conventional "D-Zug" express train. It was thus no wonder that the concept of the "IC 79" very quickly acquired an outstanding reputation and it was accepted by the passengers very positively. 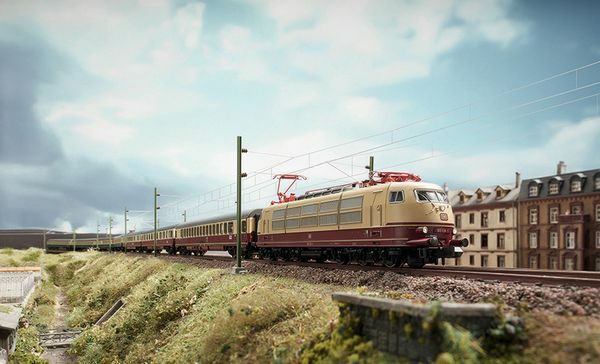 The reliability and frequency of the connections with a schedule that was very easy to remember now guaranteed the DB long distance service by rail worldwide regard and an outstanding position. In the following years, the "IC 79" system remained largely unchanged and the number of trains remained more or less constant. It had merely grown to 162 by the introduction of "IC 85".